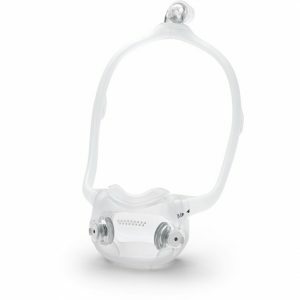 What Is DreamWear Full Face CPAP Mask? Who Should Buy DreamWear Full Face CPAP Mask? Life with sleep apnea can be incredibly difficult in even the best of situations. Sleep apnea can be a debilitating sleep disorder that takes away from you the very essence of a night’s rest. Fortunately, scientists have been hard at work over the years discovering new methods of treatment for the challenging disorder. One of the most popular ways to treat sleep apnea is by way of a CPAP machine. A CPAP machine is a continuous positive airway pressure therapy device that works to help you breathe right while you sleep. In this review, we will focus on one of the top CPAP masks on the market, the DreamWear Full Face CPAP Mask. While most CPAP masks look largely similar to one another, they certainly do not behave in the same way. Keep reading our DreamWear Full Face CPAP Mask review to find out if it is the right solution to your problem. 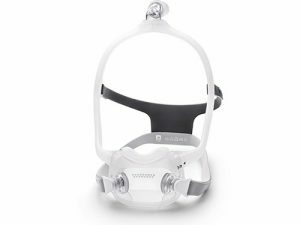 As we highlighted above, DreamWear Full Face CPAP Mask is a CPAP mask that seeks to alleviate symptoms related to obstructive sleep apnea, otherwise known as OSA. 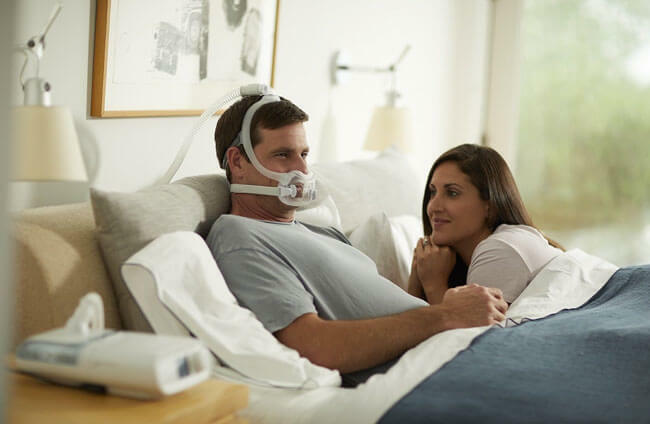 Developed by Royal Philips, DreamWear is now getting into the game with a full face CPAP mask that can help you with sleep apnea while focusing on comfort. In fact, some of the most glaring problems that CPAP users report with their devices are related to comfort. Specifically, CPAP-wearers routinely complain that the hose of their mask obstructs their sleeping and that the mask itself leaves red marks up and down their face. Now that you know what DreamWear Full Face CPAP Mask actually is, we can spend some time getting to know how the product works. After all, if every CPAP mask looks similar to one another, are there truly any differences among them? Nasal Pillows, which are lightweight and compact CPAP masks primarily designed for users who don’t want their face touched. They are ideal for people who move around in their sleep or breathe through their nose. Nasal Masks, which are bulkier than nasal pillows and cover your nose from bridge to lip. If you need a higher pressure setting, this option may be perfect for you. Full Face Masks, which are ideal for mouth breathers and people who sleep on their back. While laying on your back, you can comfortably wear your full face mask throughout the night. DreamWear Full Face CPAP Mask works in much the same way that the other full face masks operate. You wear it over your face before going to sleep. 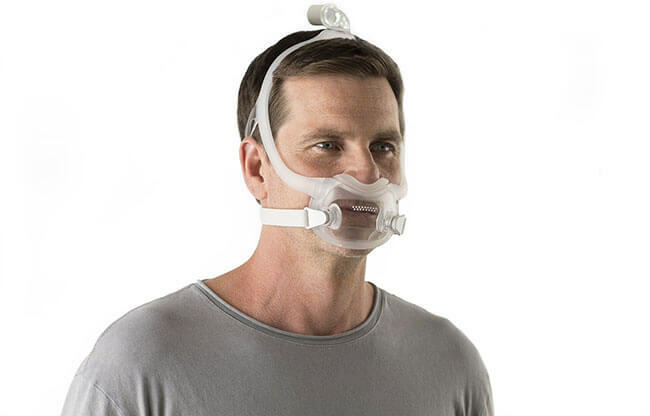 The mask is plugged into your CPAP machine through the top air tube. While you sleep, the CPAP machine pushes additional air pressure into your throat so that you don’t experience the obstructive throat collapsing sensation that is symptomatic of sleep apnea. This air pressure helps to minimize your obstructed feeling while also diminishing your potential snoring issues. While many CPAP masks are built with similar styles in mind, they are not equally made. DreamWear Full Face CPAP Mask offers a little more than your regular, run-of-the-mill CPAP mask. There are many benefits that come stocked with this full face mask and they are primarily related to comfort. Your air tube is placed atop your head, allowing flexible movement. You won’t have red marks left on your face, thanks to a comfortable and interchangeable cushion. You will be able to read or use your electronics thanks to the wide field of vision that the mask offers. You’ll be able to enjoy full face comfort thanks to the innovative under-nose design. As you can see, the team at Philips’ focused on crafting something special with their latest entry into the world of full face CPAP masks. Take the printed sizing guide and fold along the dotted line. Once folded, cut out the fitting gauge by following that dotted line. Now, hold the fitting gauge up to your nose and look down at your marking: L, M or S.
If you are going to wear something on your face on a nightly basis, you’ll likely want to learn how to properly maintain the product. With DreamWear Full Face CPAP Mask, maintenance is pretty simple. You’ll mainly want to focus on properly cleaning your mask with warm water and mild soap. Make sure that your soap does not have a fragrance. Additionally, get into the habit of washing the chinstraps and headgear on a weekly basis. This cleaning advice is, of course, on top of your routine machine maintenance which includes routinely changing or cleaning filters. With DreamWear Full Face CPAP Mask, you are getting a full face sleep mask that is ideal for treating chronic obstructive sleep apnea. This product is designed for people who sleep on their back but also want the comfort of being able to move around during the night. Additionally, full face masks are ideal for anyone who struggles with nasal breathing. If you have allergies or any other nose-related medical issues, DreamWear Full Face CPAP Mask is for you. We could talk all day about what we think of this DreamWear Full Face CPAP Mask, but we also think it’s only right to allow other users to chime in. Listed below you’ll find both compliments and complaints relating to DreamWear Full Face CPAP Mask. Compliments – Customers seemed to uniformly love how simple it was to properly size and fit their mask. Additionally, customers raved about the comfort of the mask in regard to the silicone-based cushions. Speaking of cushions, having three different cushion options that are all interchangeable was a revelation. Finally, customers were ecstatic with the flexibility that this mask provided in relation to being able to see, read and move around. Complaints – Complaints relating to this mask were few and far between. The biggest complaint relating to DreamWear Full Face CPAP Mask was the fact that some users, a minor amount, experienced minor leakage from the nasal area. When looking for a CPAP mask, it is important to note both the price and the refund/return policy. Let’s highlight the price/refund policy for DreamWear Full Face CPAP Mask. If you purchase the DreamWear Full Face CPAP Mask, you are left with a few different options if you decide to return the product. If the product is unopened, then DreamWear Full Face CPAP Mask can be returned within 30 days for a refund, sans 15% processing fee. Additionally, DreamWear Full Face CPAP Mask is fully protected by a manufacturers’ warranty. If your CPAP mask quits working, contact the company for an RMA. If you are still unsure if DreamWear Full Face CPAP Mask is right for you, check out the key advantages and flaws of this snoring aid. When looking for a high-quality CPAP mask, you need to focus on products that are effective and comfortable. DreamWear Full Face CPAP Mask checks all of the boxes in the realm of comfort and the glowing customer reviews show that this full face CPAP mask is as good as any on the market. The price may be a little high, but the quality bears the burden. Our ratings are the result of an objective and independent evaluation of DreamWear Full Face CPAP Mask, generating the final rating that reflects the overall quality of the company. Ratings may change as the product introduces changes. DreamWear Full Face CPAP Mask user rating based on 6 user reviews. The nose piece is making my nose sore but when I adjust the pressure down, my apnea returns. Other than that, you can allow yourself a pretty loose fit and it still stays well in place without any leaks. Dreamwear is the most lightweight and comfortable mask I've ever used, and I've been using them for more than nine years. I've been wearing it for two weeks now and I'm still tinkering with minor comfort adjustment but I think this still falls on the break-in period. I can even watch TV without closing and I just by moving the nose holder off to the side. It's a great set up that gives me much more freedom than my previous full nose mask. I can adjust it so that it's tight enough not to spring any leaks but loose enough to be quite comfortable. It feels much less confining and hasn't left any marks on my face like my previous full mask. So, much more comfortable with less claustrophobia. It has slided loose during the night once but that was my fault since I didn't yet know how to tighten it for perfect fit. Last night was the first night with Dreamwear mask and it was the first full night's sleep I had in years. I had nothing but trouble with my past gear and purchasing this mask was a gamble of a desperate man. However, no leaks whatsoever and I didn't have to adjusted during the night. The hose is very flexible and soft so I didn't have to drag it with me when sleeping in any position. It's just a third of the price I had to pay for my previous gear, which also includes the portion paid by my health care insurance. I've tried many CPAP masks in this is the most comfortable I've ever used by far. It's pretty lightweight, doesn't cost much, and it comes apart very easy for cleaning. One of the best things about it is that the fabric never comes into contact with my skin which eliminates the issue I had with other masks. My skin is very sensitive and I've been subject to breakouts in the past, so I had to put a lot of antibacterial cream before bed with every mask I used before. We found 0 verified DreamWear Full Face CPAP Mask discounts for April, 2019.